February 25th in Wordpress Plugins by Wordpress Jedi . 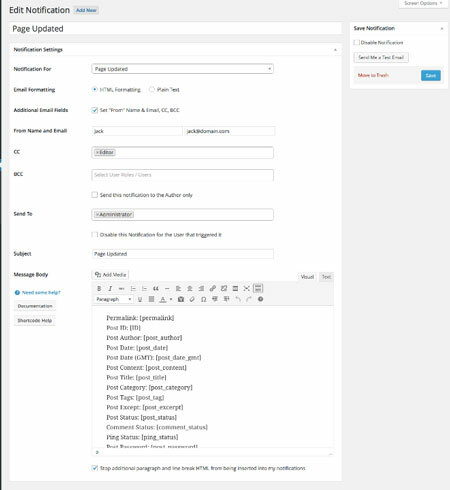 So you want to send custom emails to WordPress users for different events? Better Notifications for WordPress can help you do just that. This is a free plugin that lets you create custom e-mail notifications for different roles or individual users. 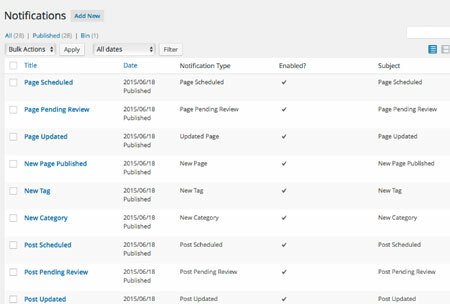 The plugin can handle a wide variety of events, including new comments, post updates, and new user registrations. Better Notifications lets you change e-mail format, fileds, message body, and other settings. You can easily choose who to send e-mails and from whom. You can choose notifications for new comments, lost passwords, updated posts, new categories, and other events. Better Notifications sends e-mails via WordPress. You can also send them via SMTP using a third party plugin. This is a free plugin.